LIONEL Fastrack 2 MAIN LINE LOOP TRACK PACK Run two trains on this layout design and start your busy railroad empire! Just think, this is only the beginning of what you can build! This complete track set will allow you create this detailed layout shown. No additional track is required. 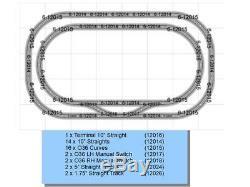 INCLUDES: 15 x 036 FasTrack 1 x 10" Terminal Straight 14 x 10" Straights 2 x 5" Straights 2 x 1.75" Straights 2 x Manual RH O36 Switch Track 2 x Manual LH O36 Switch Track the 4 quarter curves included with the switches will be used as a full curve for this layout, see picture for details. LIONEL never issued this as a p re- packaged item. Dimensions assembled: 5' x 8. Will run your Lionel, Kline, MTH, Weaver, MDK, or any O/O27 trains! And receive our final invoice to pay. All items must be paid within 7 days. Value Added Authorized Lionel Dealer. 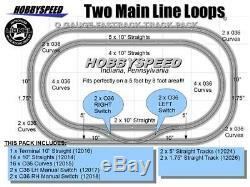 The item "LIONEL FASTRACK 2 MAIN LINE LOOP TRACK PACK 5'x8' O Gauge Train Layout fast NEW" is in sale since Monday, May 12, 2014. This item is in the category "Toys & Hobbies\Model Railroads & Trains\O Scale\Other O Scale". The seller is "hobbyspeed" and is located in Indiana, Pennsylvania. This item can be shipped worldwide.